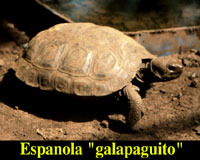 These differences are related to the environments in which the respective tortoises live, and the types of food they eat. The domed tortoises tend to live in the moist high-lands and take their food from grasses and low-lying shrubs. The saddle-backed tortoises, on the other hand, live in arid regions and feed on plants that are mostly above their head, most notably the tree-like Opuntia (prickly pear) cactuses. The arched shell permits them to stretch their heads high, giving them a longer vertical reach. There is a very interesting relationship between tortoises and the various Opuntia species that inhabit the various islands. On those islands where there have never been any evidence of resident tortoise populations (e.g. 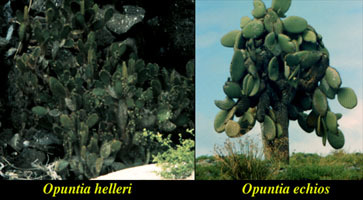 Genovesa), the resident species O. helleri tends to spread low over the ground and has soft, flexible spines, whereas on islands that have established tortoise populations, the resident species, like O. echios on Santa Cruz tends to grow as trees. As young plants, the trunks are thickly covered with long, sharp spines which give way in older plants to a tough, tree-like bark. Thus, these Opuntias are inaccessable to the tortoise until the fruits, laden with seeds, fall to the ground, whereupon the tortoises eat them. The seeds pass unharmed through the tortoise's gut and are dropped as the tortoise wanders from place to place. large tortoises are more resistant to cooling during prolonged cloud cover typical of the highlands. A second difference is that saddle-backed tortoises tend to be more aggressive and solitary while domed tortoises tend to be more gregarious. Aggressive displays are contests to see which of two combatants can raise their head the highest. 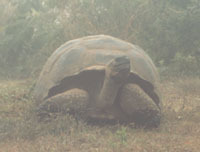 On one visit to the Galapagos, I was sitting in the tortoise compound on a cool, cloudy morning. As expected, there was little activity, but as the sun came out and everything warmed up, I noticed three tortoises, side-by-side waking up. As they became aware of each other, they begain to raise their necks with gaping mouths, each trying to out-do the other. This aggressiveness might force the tortoises to become more solitary, thereby avoiding competition for food. Thus natural selection might favor the arched shell in dryer areas because it provides for greater reach while foraging as well as greater reach during combat while protecting food. Tortoises mate during the the rainy season, beginning in January. On the large islands, they gather in the wet highlands and begin copulating. The male mounts the female from behind (his plastron, the lower side of the shell, is concave to permit him to balance on top of his mate) and then, during copulation emits a loud groaning sound which can carry quite far. The significance of the sound is unclear. After copulation, the females make their way down to the lower, coastal regions where there are good nesting grounds. Using their bodies, they scoop out a shallow depression, 30-40 cm deep. The soil is softened with urine during digging. Finally, 2-16 round, hard-shelled eggs are laid and the nest is sealed with a cap of mud moistened with urine. A female can lay 4-5 clutches per season, usually between June and December. The eggs hatch 4-5 months later. In the pristine state, tortoises had few natural enemies - mostly Galapagos hawks, and possibly owls, that preyed on the hatchlings. But in the age of man, tortoise populations have been depleted by human activity both directly and indirectly. During the whaling era, the tortoises were highly prized by sailors for provisions because they could live for long periods of time without food or water, with little deterioration. In the days before preserved food, this was of great value to sailors who visited the Galapagos and carried off many thousands of tortoises. Because interiors of the islands were so inaccessible, the sailors concentrated on the coasts and took away, therefore, massive numbers of breeding females. Feral animals have also wrought havoc on tortoise populations. Pigs, dogs, and rats dig up nests and eat eggs and young. Goats directly compete for food and donkeys trample nesting areas and change the topography from forested areas to grassy plains. Well into this century, people have continued to exploit the tortoises for oil. 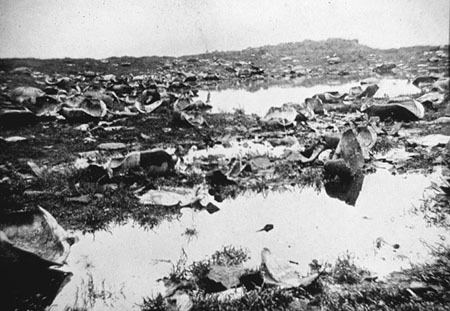 The photo below showing the remains of hundreds of tortoises slaughtered on Isabela for oil, was taken in 1906 by a member of the California Academy of Sciences expedition, and this activity has gone on up until the foundation of the National Park in 1959. Since1959 scientists at the Charles Darwin Research Station have begun a very successful two-pronged tortoise reclamation program. Eggs from both wild tortoises and breeding colonies at the station are hatched in incubators and the hatchlings cared for until they are big enough to be released with a good chance of survival. The other part of the program is to eradicate introduced animals on the various islands. As a result, the Espanola population, for example, reduced to less than 15 individuals, is now flourishing. But despite the advances, tortoises are still in a precarious situation. In 1995 fishermen who were unhappy with new government regulations on sea cucumber fishing killed tortoises on Isabela and forcibly occupied the Charles Darwin Research Station on Santa Cruz. 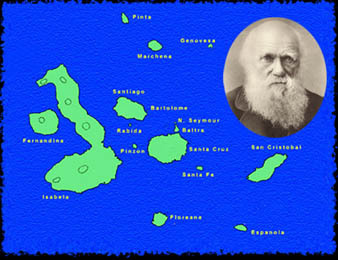 If their demands were not met, they threatened, they would kill Lonesome George, noted above as the sole surviving member of the Pinta island race G. e. abindoni, and the symbol of the conservation efforts in the Galapagos. Volcan Alcedo, Isabela, long considered to have the healthiest population of tortoises, is being over-run by feral goats. Alcedo is now closed to visitors and the Darwin Station is waging the "Alcedo Campaign" to kill the goats. As we left the rim of Alcedo on my 1991 trip, I looked back and saw my last tortoise for the day, slowly being enveloped by the gathering mists of low-hanging clouds. The Galapagos tortoise is as endangered now as it has ever been.